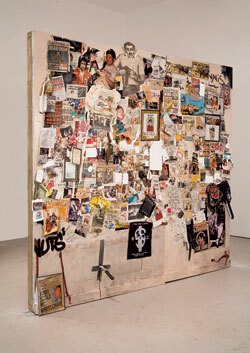 Drawing from mass media, environmental experience and sub-cultural language, Dan Colen’s work infuses a sense of magic in the under valued and ordinary. 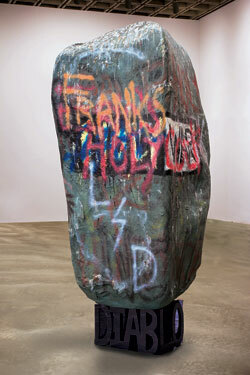 In Untitled (Vete Al Diablo), a graffitied boulder is fictionally transplanted from suburban wasteland. 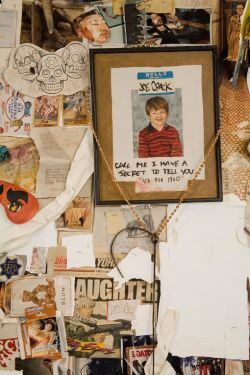 Towering as a henge-like monument, it immediately conjures images of teenage ritual, exuding a reliquary aura as degenerate totem. It is in fact made from papier mâché expertly faux finished to look like the real thing. Colen creates a duplicity in the sculpture’s rough hewn appearance, elevating the overlooked and forsaken to a contemplative object of inspiring craftsmanship. 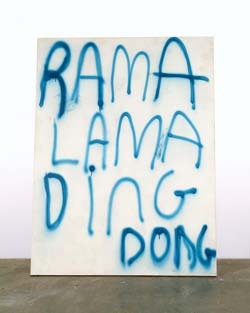 Dan Colen’s text paintings, such as Rama Lama Ding Dong, are a practical response to his time consuming realist work. 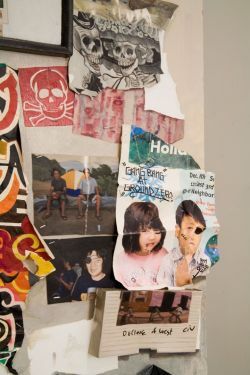 Quickly scrawled in spray paint over plywood boards which are built up with sanded layers of moulding base and acrylic, they retain a tension between immediacy of expression and perfection of surface. 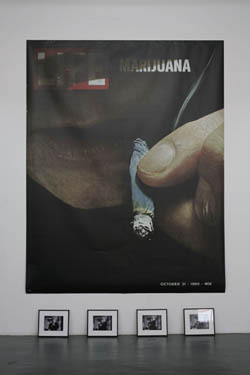 Spelling out song lyrics, random thoughts, or absurd slogans Colen’s texts create a form of urban poetry, conjuring effete images through word association and bereft aesthetics. 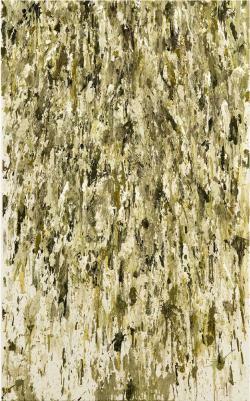 Often times Colen hand-renders these works, creating the effect of aerosol through painstaking brush technique. 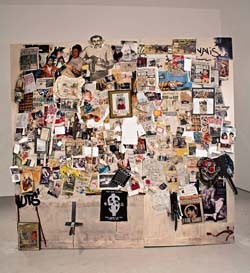 Dan Colen’s Secrets and Cymbals, Smoke and Scissors (My Friend Dash's Wall in the Future) is a life scale recreation of the interior of his friend’s apartment. 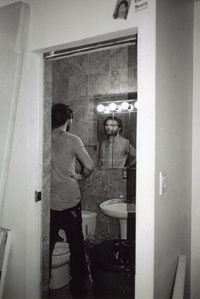 Reconstructed from snapshot photos, every element has been meticulously crafted and exactly placed. 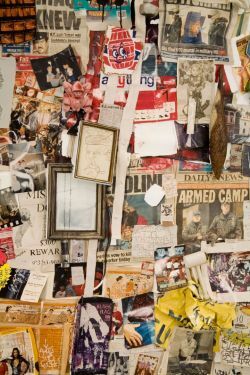 Using the deceptive qualities of trompe l’oiel, each newspaper clipping, flyer, sticker, photograph, and hand-scrawled note has been deceptively rendered in paint. In duplicating this plebeian scene Colen imbues the collected ephemera of a person’s existence with a heightened drama, creating both an exacted portrait and amonument of wonder.